Due to the extremely high temperatures experienced in the region a key requirement was to build with thermally insulating building systems. To meet this requirement ABP Building Products are supplying ABPPolyBlocks for the walls and TASS for the upper floor slabs. Another key requirement was to use local labour. PolyBlocks are simple to build with and unlike the 6-9 months required to become a competent brick layer operators can be trained to build with the Polyblock system in a couple of days. 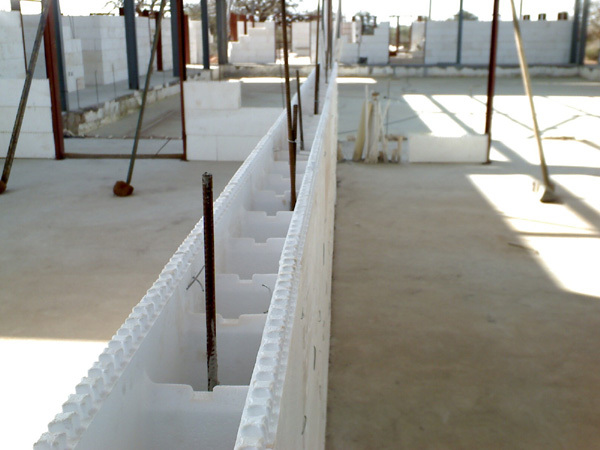 Polyblock uses a hollow, moulded expanded polystyrene building block which fits together like a ‘lego’ set and is filled with reinforced concrete. The polystyrene is plastered with an expanded polystyrene plaster system, Polyplast which is a combination of acrylic resins with plaster sand. Polyplast has excellent adhesion to expanded polystyrene, is easy to apply and does not crack over time. 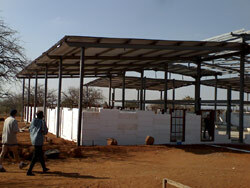 The TASS system is being used for the floor slabs. 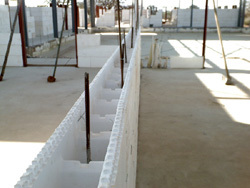 TASS is essentially a “rib and block” floor slab system with the advantages that the components – cold rolled lipped steel ribs and expanded polystyrene void formers, are lightweight so do not need heavy lifting equipment to install, are dimensionally very accurate and once in place act as thermal and sound insulators. Both Polyblock and TASS have the advantage of reducing site logistics in these remote locations as they are easy to move around the sites being lightweight. The project is being fast tracked to finish in the third quarter of 2007 and both Polyblock and TASS have the advantage of being ‘quick to build’ systems. Limpopo educational centres showing steel outer frame, ‘cliscoe’ door and window frames made to fit the Polyblock widths and Polyblock construction to mid wall height.